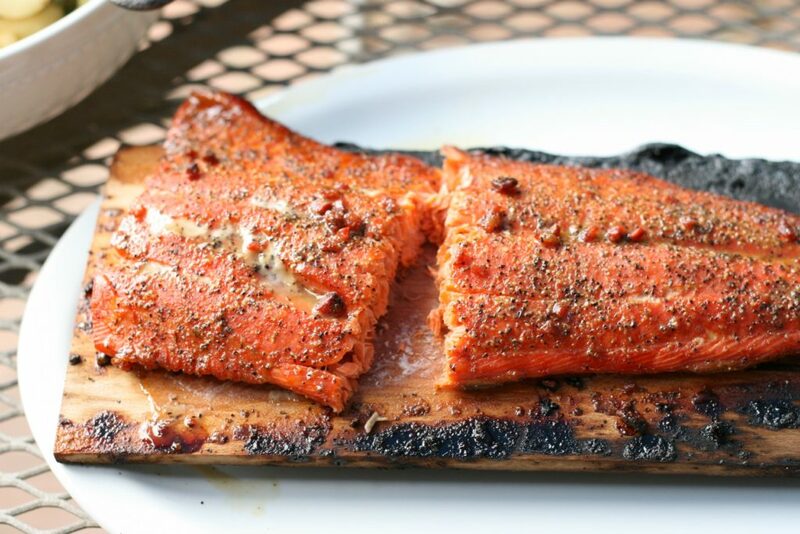 Maple Bacon Wild Salmon is grilled over charcoal on a wooden plank, wonderfully moist and flavorful. The perfect dish for your backyard picnic! I was born and raised on a small farm where we raised our own pork, produced pure maple syrup, and grew much of our own food. Because my farm roots are so strong, I love being able to shop at a grocery store that offers locally grown, quality produce and fresh meats. I love entertaining on our back patio, which overlooks the horse pasture. Host your next cookout with premium ingredients like USDA Prime beef & Colossal Grilling Shrimp plus ready-to-grill entrées and ready-to-eat sides from The Fresh Market. The Fresh Market has their own line of spices and meat rubs. Maple Bacon Spice Rub is amazing on Fresh Wild Salmon, USDA Prime Beef (their NY Strip steaks are SO good! ), Chicken, and Shrimp. Since maple was such a big part of my upbringing, I thought I’d give this one a try! And, boy was it beyond delicious! 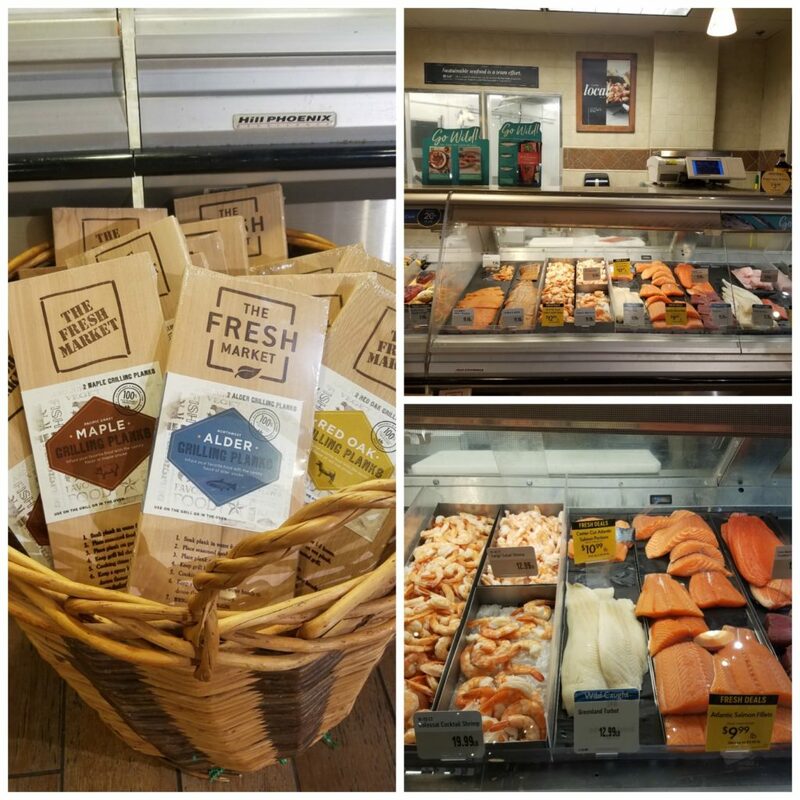 The Fresh Market is known for providing a wonderful selection of high quality specialty foods and premium ingredients. From seasonally fresh produce to exceptional meat and seafood, fresh baked goods made in each store, and carefully selected organics, they offer fresh, delicious food with friendly service in a warm and inviting atmosphere. Get more grilling inspiration here– from The Fresh Market! How do you cook Salmon on a wooden plank? Step 1: You’ll want to be sure and soak the wood plank for a minimum of 2 hours. The longer you soak it, the less likely it will burn. Step 2: Preheat your charcoal grill to medium high heat. Step 3: Place the salmon on the wooden plank. Rub the salmon with a few teaspoons of spice rub. Step 4: Place the wooden plank with the salmon on the grill on the hot grate, away from the hot coals. Cook for 20-30 minutes, or until the internal temperature of the salmon reaches 135 degrees F and the salmon flakes apart with a fork. Step 5: Serve right off the plank with seasonal vegetables, rice pilaf or mashed potatoes. Wild Salmon Season is here! Wild Salmon is flown in fresh to The Fresh Market stores for peak flavor. Fresh, Wild Salmon is a seasonal summer treat that tastes amazing when grilled. Be sure and check out The Fresh Market’s grilling website for more inspiration and recipes! Doesn’t this Wild Salmon look so juicy and flavorful?! Why is salmon cooked on a wooden plank? The fish gets steamed gently with heat from the grill, while staying extremely tender and juicy. The wooden plank also keeps the salmon from burning or falling through the grates. Step 1: Peel the potatoes and wash them. Slice into small cubes and place into a saucepan with cold water. Add a teaspoon or so of salt. Step 2: Boil the potatoes until tender. Drain the potatoes and place back into the saucepan. Step 3: Add butter, heavy cream or buttermilk, salt and pepper to taste. 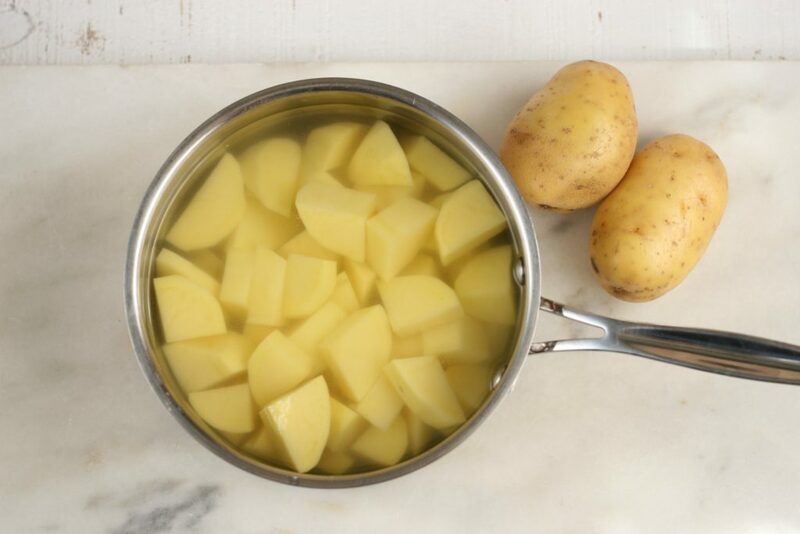 Use a potato masher or an electric hand mixer with beaters to mash the potatoes. Adjust the salt and pepper as needed. Place the lid on the saucepan to keep warm until ready to serve. After you mash the potatoes, squeeze in a whole head of roasted garlic and about 1 teaspoon of finely chopped frozen rosemary leaves. Slice off the top of a whole head of garlic, place it in the center of double layer of aluminum foil. Drizzle with a little extra virgin olive, sprinkle with salt and black pepper to taste. Close up the foil and crimp the edges. Cook on the grill over medium heat about 25-30 minutes, or until soft. The Fresh Market’s flowers couldn’t have impressed me more! Their floral department is so impressive and the flowers couldn’t be more fresh! Believe me, as the owner of a wedding floral design company for nearly 17 years, I’ve seen my share of fresh flowers. And, I’m rather picky. Stores are organized to perfection, spotless, and fully staffed with extremely pleasant and eager individuals to help you! I love shopping at The Fresh Market for all of our grilling essentials! Find a store near you! 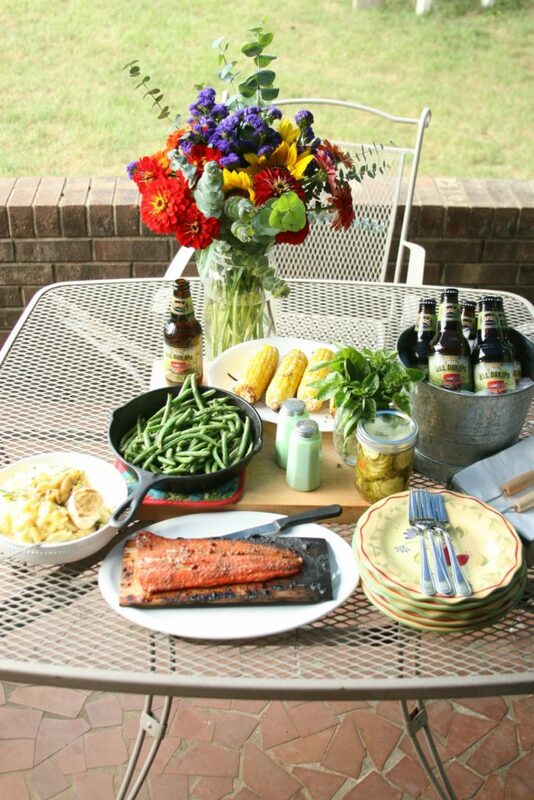 We enjoyed having friends over and taste this delicious wild salmon and sip on ice cold Founders All Day IPA. Be sure and check out all The Fresh Market has to offer right now! Click here for more grilling inspirations and ideas! 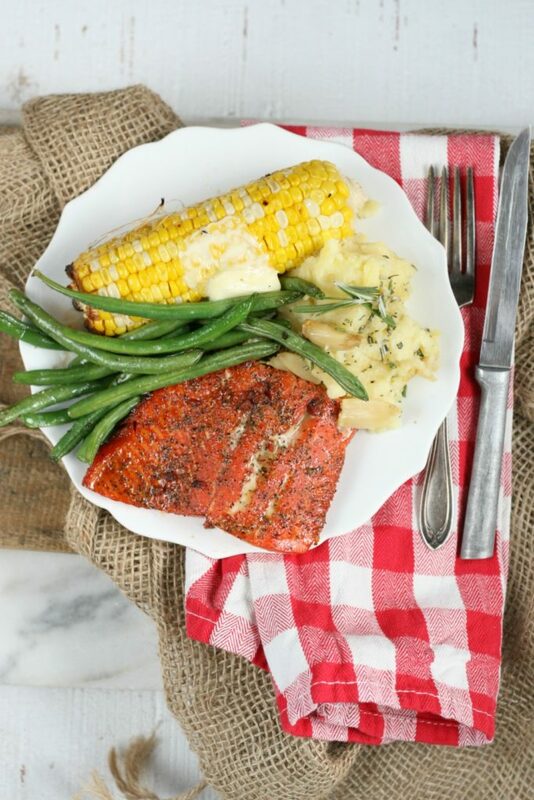 Maple Bacon Wild Salmon has a flavorful spice rub and cooked on the grill on a wooden plank. Soak a wooden plank in water for a minimum of 2 hours. Preheat your charcoal grill to medium high heat. Place the salmon on the wooden plank. Rub the salmon with a few teaspoons of spice rub. 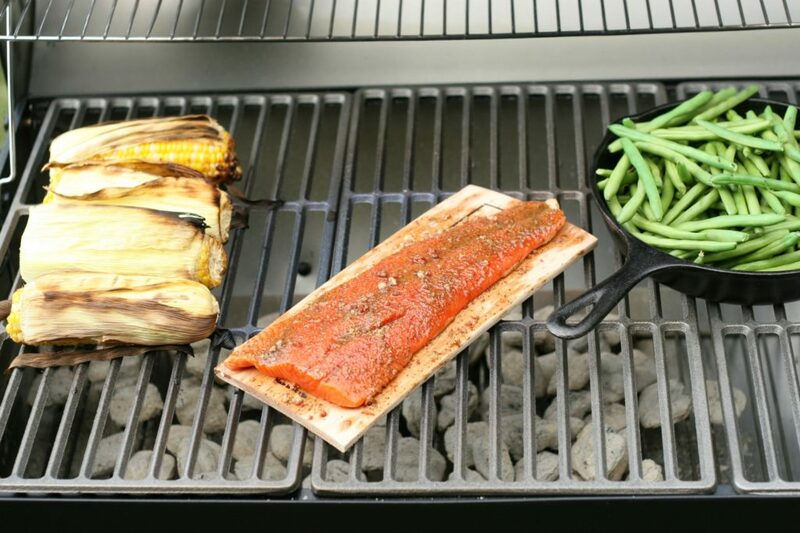 Place the wooden plank with the salmon on the grill on the hot grate, away from the hot coals. Cook for 20-30 minutes, or until the internal temperature of the salmon reaches 135 degrees F and the salmon flakes apart with a fork. Serve the salmon right on the cedar plank, along with seasonal vegetables, rice pilaf or mashed potatoes. Nice!!! This is right up my alley… I love Fish and I loovveeeeee Maple Bacon, I could eat this all day long. Haven’t had this for a while, def. going to make this this weekend. You had me at Salmon. Bacon sealed the deal. 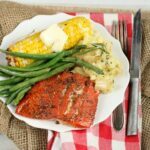 Add in the fact that salmon is relatively easy to cook and I’m adding this recipe to my weekly meal plan. This salmon is SO easy to cook on the grill! Ask the butcher to remove the skin for you! Then lay that side down on the wooden plank. Oh my gosh, yes! This is my kind of meal. Everything looks incredible! I tend to love all things with bacon. Thanks Amber!! It was so good!! I hope you’ll try it too! 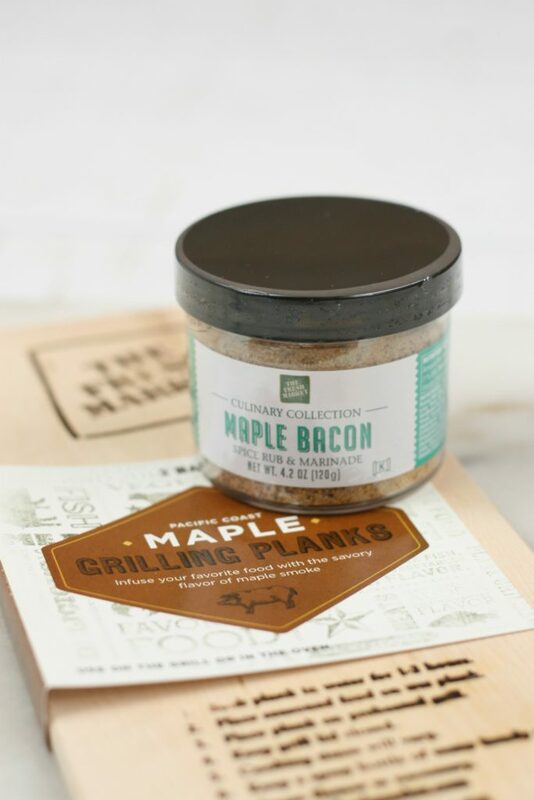 This literally made me drool – Maple Bacon yum! And roasted garlic mashed potatoes are some of my favorite things to eat right there. Thanks for stopping by!! This salmon is SO darn good! Hope you love it! 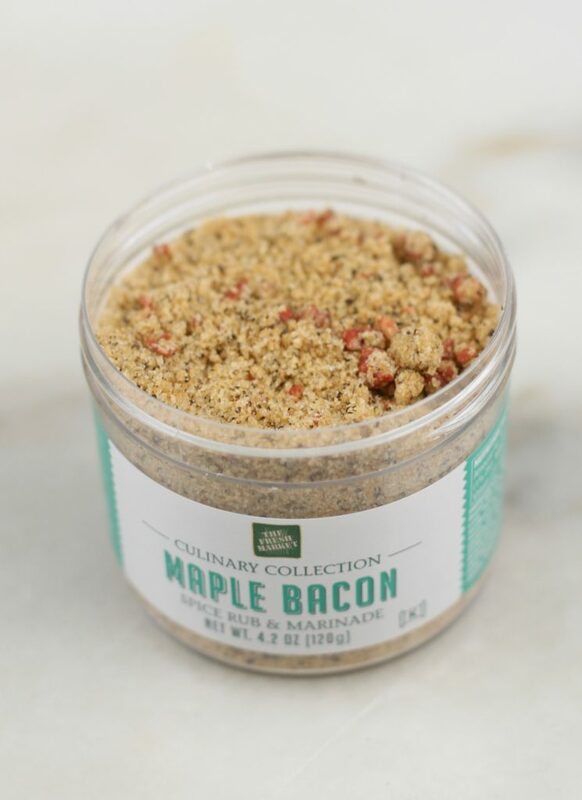 Maple bacon sounds like a great flavor. I need to get some salmon to try this recipe. No wonder I love the country side, or rather farm lands! You always get fresh produce for the kitchen! Anyway, I love how you prepare the salmon dish…it looks so scrumptious and I’d love to eat that with rice!Yuum! I love salmon! Soaking it on a wooden plank is a new idea for me. Thank you for sharing your recipe, hope I can try it too! The pictures are appetizing! That spice rub looks incredible. I can smell and taste it from here!!! That salmon looks absolutely phenomenal and I can’t stop staring at it! I’m salivating just sitting here looking at it. Lovely photos! Your cooking style reminds me of Jamie Oliver! Thank you SO much for your sweet comments! I’m glad you love my recipes and pics! Now that looks absolutely tasty, I’d love to try this one out someday. The salmon is nicely done and is quite mouthwatering. I have been using my outdoors bbq quite a lot these days. Whilst I cooked a lot of meat on it, I didn’t yet do fish. Your recipe sounds so good and that maple and bacon rub so yummy and flavorsome! This looks tasty. Love me some good fish. I’ll try this recipe this weekend. I love any kind of salmon, so I know I would love this! I need to get my hands on that spice rub!! OMG yum. I want this recipe immediately. I love salmon and so does my family! Saving this for later! This sounds awesome. I really like the sounds of this rub. Great post! I didn’t know they’ve spice marinate for salmon. It looks so good, I might check this one out. What a savory dish. I want to try it this weekend. I am always on the look for new recipes that both my husband and kids would enjoy. Thanks for sharing! Bacon and salmon? Why not? Sounds like a delicious pair. Looks fantastic. I LOVE wild salmon and in fact, it is the best! What a great recipe, and thanks for sharing all the tips about grilling salmon on cedar and your roasted garlic tips. Your table setting looks so perfect for summer entertaining, well done and I can’t wait to try this recipe by our pool this summer!